George Osborne has declared a salary of £650,000 a year for working just four days a month at BlackRock, the world’s biggest fund management firm, as well as almost £800,000 for speeches to financiers. 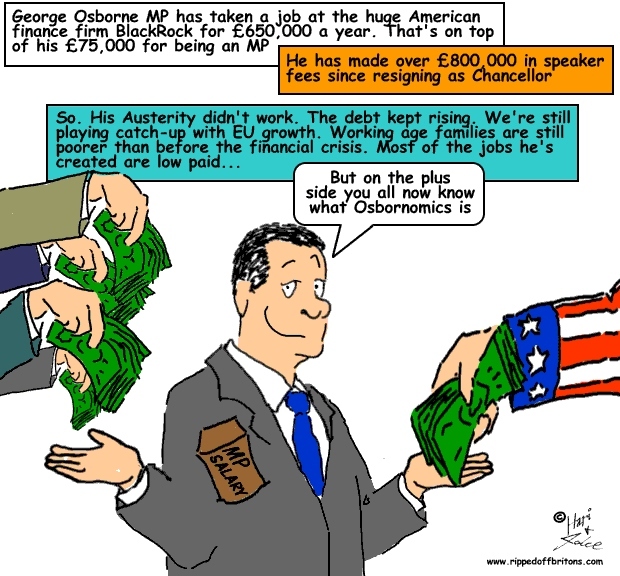 The former chancellor’s earnings were revealed in the latest register of MPs’ interests, which shows that he will make more than eight times his salary as a backbencher as an adviser to the Wall Street firm. He was criticised for taking the job earlier this year, because BlackRock may have benefited from reforms to pension rules made while he was chancellor. Former Chancellor George Osborne, who is paid £75,000-a-year to fulfil his duties as an MP, will be working one day a week as an adviser to the vast American finance firm, BlackRock. This position will add around £200,000 a year to the household income at the £4million Notting Hill home he shares with wife Frances and their two young children. It has also reignited the long-standing, and increasingly furious, public debate about the grubby ‘revolving door’ between government and the private sector. Since Tony Blair left Downing Street and began lobbying for a mixture of wealthy corporations and dodgy dictators, it has seemingly become almost automatic for ex-Cabinet Ministers to cash in by using the experience they gained in office for commercial gain. This shoddy practice is theoretically regulated by Acoba, a Whitehall appointments watchdog. Yet in the past eight years, it has not attempted to stop one single civil servant or politician from taking up a job. Osborne’s new role at BlackRock was waved through despite the fact that he’d met executives from the finance giant five times during his last two years at the Treasury. Even without this latest scandalous twist about BlackRock, which has sparked calls for a complete revamp of Parliamentary rules, there can be few dethroned senior politicians who have been quite so shameless and proactive as Osborne in their pursuit of a fast buck. His dash for cash began a mere four weeks after being sacked, when he signed up to an American speaking agency called the Washington Speakers’ Bureau. It represents 602 of what it calls ‘the world’s greatest minds’ — including those noted intellectuals Tony Blair, Alastair Campbell, George W. Bush, the former Alaska governor Sarah Palin and the magician David Blaine — and has already helped Osborne earn £628,000 and counting since he left the Treasury. Some of the financial institutions that have paid to hear Osborne’s words of wisdom are, however, a rum old bunch. They include the aforementioned HSBC, which has paid vast fines in recent years for money-laundering offences in Mexico and Switzerland, and JP Morgan, which bunged the former Chancellor £141,752 for two speeches. This is the same JP Morgan that was last month fined £288 million by European regulators for interest-rate manipulation. Then there is Citi, who coughed up £85,396 for two Osborne speeches in November (this week it was hit with a £23 million fine in the U.S. for mis-treating mortgage holders), and Aberdeen Asset Management, which spent £51,328 getting him to talk to investors two months ago (and which not long ago paid a £7.2 million penalty to the Financial Conduct Authority for failing to properly protect client funds). Most curious of all, however, is a mysterious organisation called Palmex Derivatives that flew Osborne to New York in October, where it paid him £80,240.16 for giving a two-hour talk. This secretive firm — whose operations are said to include financial and insurance activities, security broking and fund management — has no website, no listed telephone number or email address and was, until December, registered to a detached brick home on a cul-de-sac in Southend-on-Sea. Now listed at a service address in Caterham, Surrey, it has just two directors, a 34-year-old ‘futures and options broker’ called Robert Palmer and his domestic partner Kirsty Lewis, who describes her occupation on Companies House documents as ‘home-maker’. In its last published accounts — up to January 2016 — Palmex listed assets of a mere £54,598, so hiring the former Chancellor appears to represent a huge investment for such an apparently small firm. And there is the intimate nature of the relationship Osborne appears to have forged with his new employer, BlackRock, while his day-job was running the British economy. The average UK household's disposable income - or spending power - rose by nearly £600 in 2015-16. The typical household had £26,332 to spend after taxes were paid and benefits received, the Office for National Statistics (ONS) said. Senior statistician Claudia Wells said: "Household incomes are above their pre-downturn peak overall, but not everyone is better off... While retired households' incomes have soared in recent years, non-retired households still have less money, on average, than before the crash." The ONS puts growing private pensions ahead of the guaranteed rise in the state pension - under the so-called triple lock - as the long-term reason for the pick-up in pensioners' incomes. Household income has tended to pick up faster over the years owing to an increasing number of couples both in employment. Matt Whittaker, chief economist at the Resolution Foundation think tank, said: "Strong employment growth, low inflation and rising pensioner incomes over recent years have helped drive inequality down to its lowest level in nearly 30 years... However, the last three years of growth have come back off the back of a living standards squeeze so deep that typical working age families are still £345 poorer than they were before the financial crisis. With employment plateauing, productivity growth refusing to budge and inflation rising, the risk is that this mini boom won't continue."